It is known that there are many systems which are described by nonlinear operators. One of the simplest nonlinear cases is the quadratic one. In the previous chapters we have considered classical (i.e. commutative) quadratic operators. These operators were defined over commutative algebras. However, such operators do not cover the case of quantum systems. 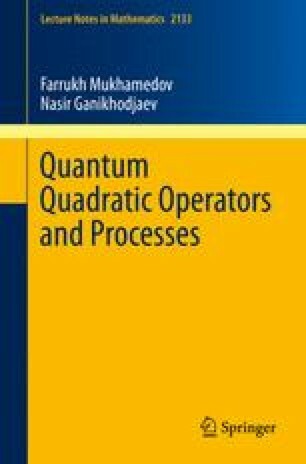 Therefore, in the present chapter, we are going to introduce a noncommutative analogue of a q.s.o., which is called a quantum quadratic stochastic operator (q.q.s.o.). We will show that the set of q.q.s.o.s is weakly compact. By means of q.q.s.o.s one can define a nonlinear operator which is called a quadratic operator. We also study the asymptotically stability of the dynamics of quadratic operators. Moreover, in this chapter we recall the definition of quantum Markov chains and establish that each q.q.s.o. defines a quantum Markov chain.